Emre Coşkun from Gümüşhane province built a wooden caravan which can produce electricity with solar energy in order to spend time in nature. Coşkun designed and built the caravan which can accommodate six people at once in approximately 45 days with his father. It can be connected to a four-wheel drive. He parked the caravan in Aybolos Plateau, which is at an altitude of 2,100 meters. Thus, he spends his free time in nature with this caravan. 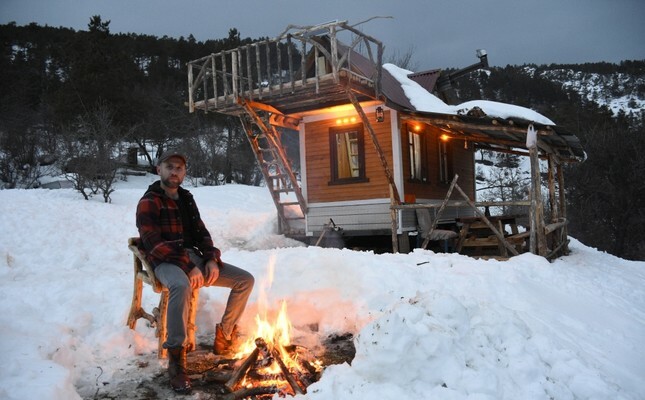 Coşkun, 38, who enjoys a peaceful life in snowy nature with his caravan, also welcomes guests from time to time. Speaking to Anadolu Agency he said that he lived in Istanbul for nearly 20 years and then returned to his village because of his homesickness. Mentioning that he loves village life and nature, Coşkun noted that he followed his dreams after he moved to Mescitli village. Coşkun said that he wanted to transfer the tiny house culture in the U.S. to his city as he is a nature lover and his father is a carpenter. He said this is why he built a caravan. He said the caravan was built for a life in nature, and a way of realizing his dream. Coşkun said, "I built this caravan in 45 days, and drove it to an altitude of 2,100 meters by connecting it to my four-wheel drive. I designed it to be 18 square meters in width and 2 meters in height. We can light a stove inside. I designed each place, including the bath, toilet, kitchen and beds, by thinking and planning. We produce electricity with a solar energy system. I placed leaf springs on the lower part. Therefore, it can drive on inclined fields." Pointing out that he does not need internet in his caravan, Coşkun added, "I like being in nature. It is enough for me to have a radio. Not having a Wi-Fi connection is also good. I like such a life. I design my own caravan for a peaceful life in nature." Coşkun stated that he no longer has any expectations about city life and that he achieves real peace of mind in nature. He said that these kinds of products are part of the travel culture in the U.S.
"Life returns back to what it is like originally and we go back to nature," he said. "There is great demand on social media. There are people who want to come and visit. Those who are close to my location can come and satisfy their curiosity. We have a lot of guests. I wait for everyone who wants to visit." Coşkun completed the caravan a year ago and spent about TL 50,000. He said that some of the caravan companies want to order a caravan from him and he is preparing to begin mass production as of this spring.